The second course for this year's White Truffle Dinner was Burrata Cheese with Arugula in a White Truffle Champagne Vinaigrette. The notion of including a salad on the menu has always held appeal for me, in part because it provides an easy vehicle -- i.e., the dressing -- through which to highlight the flavor of white truffle. In this context, I've never been particularly fond of mixed greens, preferring instead the steady backdrop of a single type of green against which the flavor of the dressing can be fully perceived. I'm also a proponent of pairing the salad with another component of some sort, be it bread, cheese, or even something more substantial. In my view, this type of diversion can help keep the diner interested, while also heightening the impact of both the salad and the accompaniment. This year, I decided to pair the salad with one of my favorite food "discoveries" of the past year -- burrata cheese. My tastes in cheese generally tend to run to the more dramatic, whether it's a pungent brie, a tangy feta, or a nutty parmigiano reggiano. It's not that I dislike milder cheeses such as fresh mozzarella; I just never fully understood how some people could grow so rhapsodic when talking about them. All of that changed earlier this year, though, during a dinner that I enjoyed at Ame. My friend A had ordered the Burrata Cheese with Organic Greens as a starter, and she kindly offered me a bite. The cheese was unlike any I had ever tasted -- rich, sumptuous, and utterly creamy, with a distinctive flavor that left me wanting to return my appetizer to the kitchen forthwith. It wasn't until several months later that I found out the source for Ame's burrata: a Southern California company called Gioia, which distributes its product to the restaurant -- and to the general public -- through Cowgirl Creamery. Rhonda and I now periodically treat ourselves to a container of burrata, but it's so phenomenal that we've taken to giving portions away to our friends out of fear that we might otherwise eat our way through the entire 1 pound tub! I've always liked the taste of arugula, but for some unknown reason, I'd never really thought about including it on one of my menus. 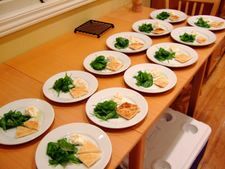 The idea of doing so finally came to me in the most unusual manner, when I saw a book review on a fellow food blogger's site. The book is called "The United States of Arugula", and the title alone was enough to make me ponder why I had overlooked this prevalent green for so long. But while tales like this illustrate that inspiration can come from the most unexpected of places, it's equally true that patently obvious ideas are sometimes the very things that are the most difficult to see. For example, despite my burgeoning affinity for burrata, the thought of including it on this year's truffle menu had completely and inexplicably eluded me. Instead, I was all set to present my guests with a Truffled White Bean Crostini -- a creation that I had tested the weekend before the dinner using cellini beans from Rancho Gordo. But as I walked through the Ferry Building a mere four days before the dinner, the idea of using burrata suddenly hit me like a bolt of lightning. Why not simply include a small amount of the delicacy on each plate, add a little bit of freshly ground black pepper on top, and then finish with a drizzle of white truffle oil? 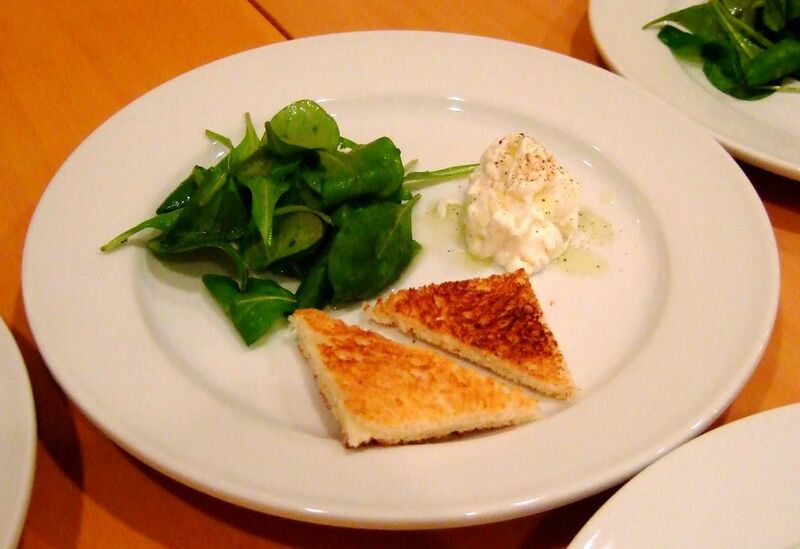 Toast points, along with the arugula, could complete the course. The idea immediately struck a chord with me; after all, what could be better than incorporating into the menu -- and sharing with our closest friends -- one of my greatest food passions of the past year? The Truffled White Bean Crostini were shelved, and the second course was set. Brilliant combination! I've never had burratta cheese, but it sounds intriguing! Kat: You simply must add burrata cheese to your increasingly lengthy list of food to experience on your next trip to the Bay Area!